When you hire an EmCee, you change the feeling of an event. The event MC is often overlooked, but wow does he or she make a difference. There are many things that have to stay the same at large company and association events, but a good host can be different, without being a wild risk. 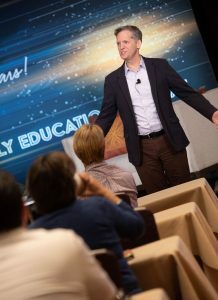 While meeting planners and committees are always seeking ways to shake things up, the reality is we still meet in conference centers or hotels, serve meals, have coffee breaks, hire speakers, schedule breakout sessions, etc… There are not many things we can do to inject fresh blood into the veins of a conference. One way that groups bring a new spark to their events is to introduce a outside professional master of ceremonies into their agenda. While this does not seem like a way to create change, it can be exactly what is needed to put a welcome twist into the experience. Most companies that host internal or customer meetings will utilize an internal executive to serve in the role of EmCee. The CEO, director of marketing or the sales manager is usually the one to do this job because they have an outgoing personality or are the primary stakeholder for the outcome of the meeting. Associations will usually have their board chair fill this role, regardless of their ability to speak publicly. When asked “Why?” it is often said that they are rewarding these people with the stage time, but the real reason might be to save money by not hiring a professional. If either answer is true, it is wrong. All major decisions made in planning an event should be about the attendee experience. Giving the MC role to a board member as a chance for them to get known in the company or industry, or saving a tiny amount of the overall event budget is not serving the participants. If the motivation around who is emcee is not about how it impacts the audience, then we are undermining the success of the conference. Too often planning committees have other motives around the agenda that are not audience driven. When cost comes into the equation and they seek areas to save money, the needs of the participants takes a back seat. Yes, events are expensive. The cost of a coffee break is huge (hotels and conference centers have made coffee more expensive that gasoline at events), but you wouldn’t skip serving coffee. Overall, an EmCee will have a better chance on impacting your meeting than just about anything else. Who hosts the event should be among the most important decisions and decided in the earliest phases of planning. It should be more important than who are the keynote speakers and whether or not you will have chocolate fountains on the dessert table. Hollywood award shows all have a host for a reason. While the Academy Awards in 2019 is looking to try going without an MC (following controversy), I doubt that will stick in future years. They actually attempted to do this in 1989 and it was considered a good show. They went back to having a main host for a reason. The Academy Awards broadcasts we remember as the best are the ones when the host was spectacular (think any year with Billy Crystal). Giving out awards is boring and so are most conferences (lets face it), but a strong personality who can serve as a strong thread that runs the through the whole show is paramount to the success. Set the tone for the event. A professional master of ceremonies should bring energy and fun to the stage. They can help create the audience mood and help everyone become more engaged. A fresh perspective. An MC who is not from your organization is not known to the audience, and thus their presence does not bring pre-conceived notions. While they may like the board member who is acting as host, they already have set opinions of that person. A new face brings with it a chance to learn and discover about someone new. Keep the show moving along on time. A huge problem at events is keeping to the schedule. An experienced EmCee will work with the speakers, planners, etc.. and keep on schedule. Many groups, after enlisting the services of an outside master of ceremonies, wonder why they had not done this before. The MC becomes part of their planning committee, as a great EmCee will have amazing ideas on who should be the keynote speakers, and how to find them. The cost for an MC for three days is not as much as some think (It is not equal to three keynotes), and many EmCees will be engaged in all aspects of your conference, not just when they are on stage. The EmCee should see themselves as the host, and always be present with the participants. If your organization has never used an MC for your conference or other large meeting, consider this a way to up the game and make the whole experience more engaging for all attendees. Hire and emcee and change your meeting for the better.